There is an art to giving gifts. When you want to really show someone that you care about them, a great gift will go a long way. One of the best gifts that anyone can give and receive is fine jewelry; but if your recipient does not have a good place to store that fine jewelry, the jewelry can become damaged. When you want to give a unique bundle of gifts, these are a few ways to give jewelry and a fine jewelry box, armoire, or case. For decades, young girls have been receiving ballerina jewelry boxes. While these pretty music boxes are not designed to last forever, they can be a good starting jewelry box for young elementary school-age girl. But, just giving the box is not quite enough. If you take the time to buy a beautiful jewelry box for a special girl in your life, then you should bundle it with a few pretty pieces of costume jewelry. None of the pieces have to be expensive, but even big faux diamond rings, strings of beads, and playful bracelets make jewelry boxes even more fun to receive as gifts and to give as gifts. If you have a teenager who is having a special event, like a birthday party, quinceanera party, or a graduation party, a fun jewelry box or armoire makes a great gift box. Maybe you bundle the box with a few costume pieces for everyday wear and you even add a piece of fine jewelry in a precious metal and enhanced with a birthstone. Your teen will be so surprised by the creativity that you put into the gift and with the fun pieces you included. 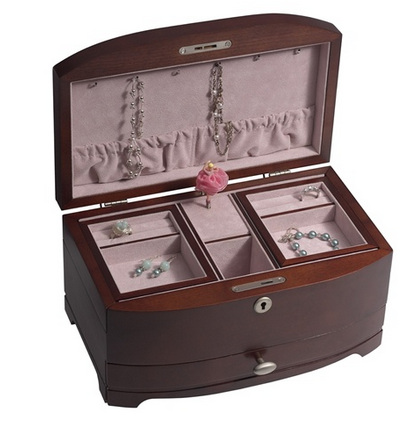 With the right jewelry box or armoire, your favorite teen will be able to care for her jewelry and make it last a lifetime. When it is time to surprise your wife for her birthday or anniversary, a jewelry gift is always a winning idea. Many women need to have better options for storing their jewelry and the boxes and armoires from Chasing Treasure are the best in the industry. While many women would be perfectly satisfied receiving a finely made jewelry box from Chasing Treasure, those same women would be surprised and grateful if the jewelry box contained more jewelry. It seems like women can never have enough jewelry, so if you want to surprise her, hang a necklace from the hooks inside of the armoire, or place a beautiful ring in one of the slots. Whatever you include will only make the jewelry box the best gift she has ever received. Even men appreciate a nice place to store accessories. Many masculine jewelry cases are fitting for items like fine coins, sunglasses, or money clips. Women often find it difficult to buy gifts for men, because there are only so many ties and football tickets that they can give. So, if you know you need to buy a nice gift, a jewelry box or valet box makes a perfect gift for the man in your life. You can fill the box with a fine accessory, like a piece of masculine jewelry or even a pair of designer sunglasses.